However, after the Christmas presents were (finally) finished, I turned my hand to a bit of knitting for our little boys. Such has been the pressure to meet the Christmas and baby deadlines I don’t have photo’s for the finished crochet baby blanket, the knitted pram blanket (in the same fluffy turquoise/lilac yarns as above), the elephant comfort blanket, the tiny baby cardigan and hat, the big baby jumper…....oh and the giant version of the crochet christmas tree. The little version was a quick secret santa present for work (below). I liked it so much that I made one for myself :) It did add to the pressure though, but hey, it amused me and that’s the main thing. Mine is 13 rows of bobbles whereas the little one below is just 7 rows. It was made with 3 strands of yarn and a 9mm hook - I basically kept going until I ran out of wool!. This Christmas I surpassed myself. I may even have reached the pinnacle of homemade excellence never to be repeated again. The festive family treat was……..
Doesn’t sound that great, but the detail provoked the expected response of hilarity all round. Now for the big reveal…….our family! We do seem to be a bit of a wild haired bunch! I’m the one next to the lad with trainers. Sadly, I ran out of time for everyone to get footwear. The smallest members of the family were a bit tricky, especially the one not born at the time of the unwrapping - see below…..our youngest member of the family safely came into the world on 27th December. Obviously, he was tucked away under the dress for Christmas. Apologies for the slightly blurry photo’s, it was all a bit of a rush to finish and wrap before the family xmas get together which was 3 days before Christmas! Another little family group with the ‘big’ baby……he’s not actually that big, it was just a bit tricky to make to the correct proportion as I had to make it up as I went along. Thanks to the inspiration and pattern from Kerry Lord ‘Edwards Doll Emporium’. For information these dolls were made using the smaller doll size from the Simply Crochet magazine calendar. It doesn’t quite end here as I’m making a Shamus (the dog) and Tigger (the cat) to add to the daughter’s little crew…….photos will follow. I am so far behind with blogging about my (mostly) crochet endeavours, but here is a sneak peek of the current baby blanket. Again, this is a team effort and of course there is a deadline :), but it is coming along nicely. I couldn't resist making this little chap when I saw the pattern in 'Edwards Menagerie' by Kerry Lord at Toft Uk. We were in a bit of a rush because we were just about to set off on our holidays and didn't want to spend a lot of time investigating. 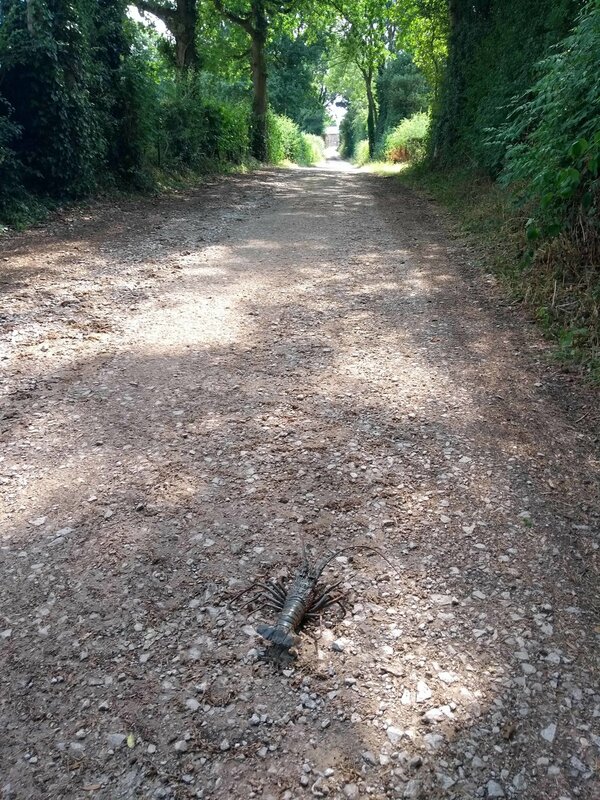 However, it seemed quite dead (or a little bit plastic) so we moved it to the side of the lane with a stick and left it. We will conduct some further enquiries and see if it's still lying around! There is still a baby theme at the moment in my world of home making, with the latest request being a couple of baby grow bags. This sort of thing wasn't around when my babies were babies so I had to do a bit of investigation before starting. 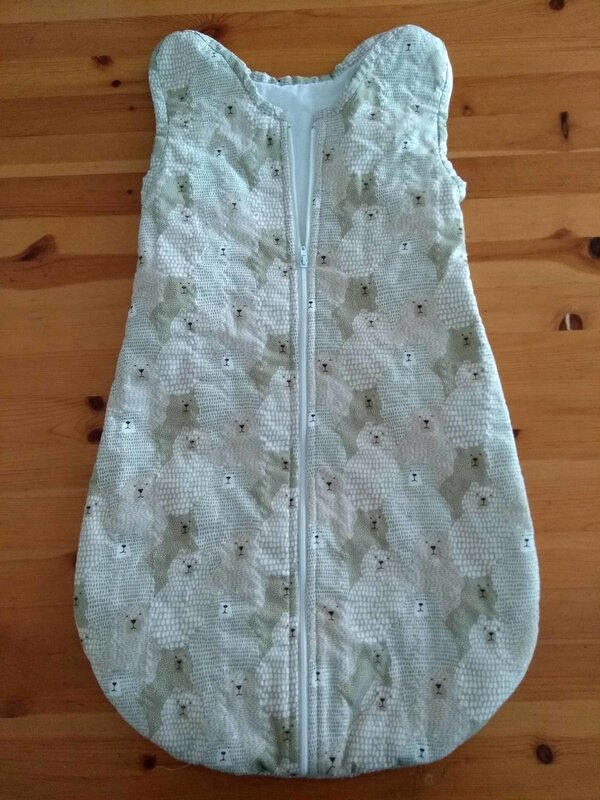 I made a pattern from baby's current shop bought bag and set about making one with some subtle but cute fabric, some spare quilt wadding and a cotton sheet (a too small reject from our bed), and of course a zip. I'm a bit out of practice at making things, but was pleased with the finished bag. More to the point, Mum and baby loved it. A little last minute knitting for the newest member of the family. Knitted in 4 ply from a Rowan pattern book but using Sirdar Snuggly Crofter Baby Fair Isle. Lovely soft yarn but I'm not sure I want to knit anything big in 4 ply - it doesn't grow quick enough! The teddy pattern is from patternsforcrochet.co.uk - thanks for the free pattern!